The resolver is a rotation angle sensor for controlling the drive motor that is the power source of EVs. By efficiently controlling the motor, power consumption can be suppressed. To control the motor according to driving conditions, it is necessary to detect the magnetic pole position of the motor and accurately understand its rotational speed. The resolver serves as a sensor for these tasks. The history of Minebea’s resolver is long, spanning a half century. We started with the development of synchro generators for aircraft instruments. 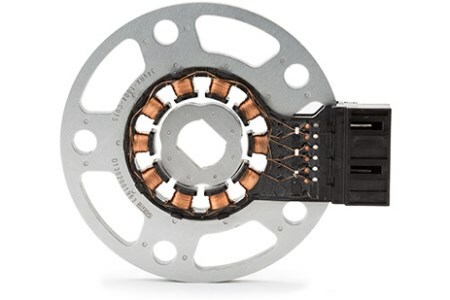 Since then, we have accumulated know-how in resolvers through development of products to various application such as those for industrial motors and automobile electric power steering motors. Since our entry into the automobile industry with the development of torque sensors for Toyota Zero Crown released in 2003, we have been supplying parts to major automobile manufacturers including Toyota, Renault-Nissan and Hyundai and other established motor manufacturers. In 2012, we developed the VR resolver for Nissan LEAF that is a next-generation eco-car. Aggregating our know-how cultivated over about a half century, we have succeeded in supplying highly reliable (heat resistance, oil resistance, etc.) and high-quality products through our stable production system. There, various unique technologies of Minebea are utilized. Technologies cultivated in the production of rotary components and machined components are incorporated cross-sectionally in the electromagnetic technology, winding technology and stamping technology of the resolver. We produce high-precision resolvers by combining multiple technologies that only a comprehensive precision equipment manufacturer can realize. 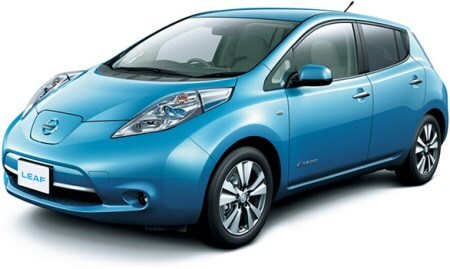 The speed of the motor that is the heart of the electric vehicle, Nissan LEAF, is controlled. 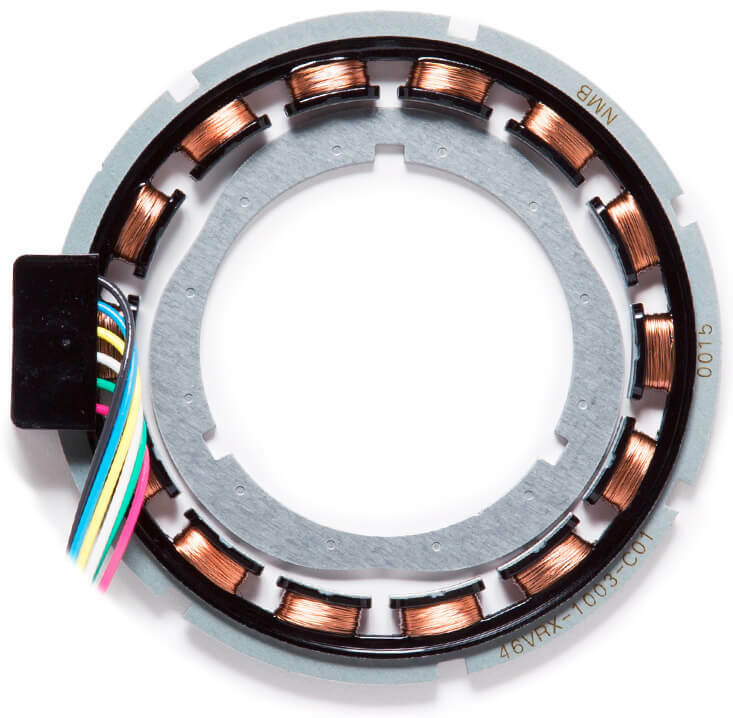 One of the parts that greatly influence the accuracy of a resolver is winding provided in the stator. The angle is detected by means of an electric signal generated due to the change in reactance of the rotating rotor and fixed stator. Stable characteristic is maintained by making the winding even. New VR resolvers of Minebea is precisely adjusted at the design stage to achieve higher accuracy. In addition, to improve resolver performance and realize its mass production, the copper wire it contains must be wound fast and evenly. Minebea’s know-how in motor production was utilized here. We applied our expertise in winding technology obtained through motor production to the resolver, and this made it possible to have faster copper wire winding than ever before. Furthermore, we designed in-house unique nozzles that are based on the diameter of the copper wire, and they are used for passing the copper wire. This allowed copper wire winding to be tight, highly accurate and stable. advantageous since welding quality can be easily controlled by visually checking the ball shape. Defects can be easily found if the ball is bent or collapsed. To realize this, peeling of the copper wire coating and welding must be done simultaneously, and this requires advanced technology. We have realized highly difficult TIG welding and kept superior durability and quality by applying our equipment condition setting technology that is one of the pillars supporting Minebea.